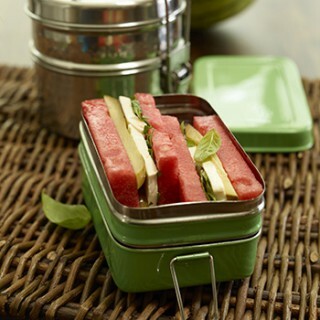 Use watermelon instead of bread for a sweet and salty summer sandwich featuring mozzarella cheese and bread-and-butter pickles. Divide the bread and butter pickles in an even layer over the 4 slices of watermelon. Sprinkle the basil over the pickles. Place an even layer of cheese over the basil using four slices per sandwich. Place a remaining slice of watermelon atop each sandwich. Using two decorative picks each, secure the sandwiches together such that you can cut them diagonally into 2 pieces. How creative. And I love your lunchbox. Where did you purchase it? Interesting idea! However, I don’t really like watermelon or mozzarella. Can you suggest any alternatives to these ingredients?